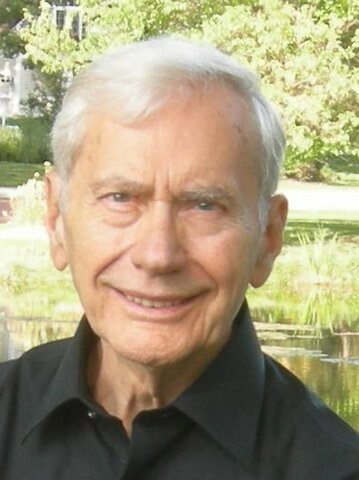 Joseph Skurla, 91 of Berwyn, died peacefully on March 30, 2019 after a short illness. Born in Allentown, PA he was the son of John and Mary Skurla and beloved husband of 68 years of Gloria May DeSorde. He is survived by his 3 children, Joseph R. Skurla (Jacqueline) of Chicago, IL, Richard W. Skurla (Alexandra) of Santa Fe, NM and Janna E. Sherrill (Alan) of Downingtown, PA. He was adored by his 8 grandchildren: Kristin, Casey, Mary Kate, Joshua, Matthew, Kalle, Danny and Mikhail as well as 11 great grandchildren: Madeline, Emma, Andrew, Will, Shea, Keane, Lauren, Sophia, Cade, Skylar and Tanner. He is also survived by his brother, John P. of Rancho Murieta, CA. Joe was a standout basketball player at Allentown HS and member of the 1945 and 1946 PIAA state championship teams. While President of his senior class, he met the love of his life, Gloria. After high school he enlisted in the US Army and was part of the 88th Division Peacekeepers in Trieste, Italy. Joe and Gloria wrote over 400 letters to each other during that time planning their future and solidifying their great romance. Soon after their marriage he attended Drexel on the GI bill where he studied Business Administration and played varsity basketball with the Dragons. Joe established his career as a Budget Analyst for Mobil Oil while residing with his family in Havertown, PA, Raleigh, NC and eventually Berwyn. He was a mainstay in his neighborhood and loved by all. As a couple, they were active at St. Isaac Jogues Church and were avid bridge players. Joe’s curious nature led him to purchase one of the first Macintosh computers. With a keen interest in the internet, he researched anything and everything, shopped, and emailed with his family and friends. He had a serious interest in trees and gardening, always looking for the best specimens. As a sportsman he enjoyed following the Eagles, Phillies and golf with an occasional Hallmark movie thrown in. Everyone loved his game day texts. The last 10 years of his life he patiently and lovingly attended to Gloria during her long decline with Alzheimer's. All who observed his selfless devoted care were touched by his genuine and deep love for her. Instilled with a love of music by Gloria, he relied on “Alexa” to play all his favorites after her death. Joe loved his country and will be remembered as a man with integrity and clarity who was thoughtful and deliberate in his actions. He often reminded his loved ones of what is important in life: Family, Faith, Friends, Love and Loyalty. Celebration of Life services will be held on July 5th, 2019 at 11:30 AM at George Washington Memorial Chapel, 2000 Valley Forge Park Rd, Valley Forge, PA.